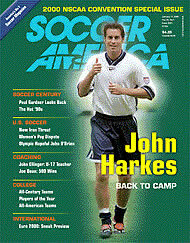 This article, which features YPT founder John Fisher, appeared in Soccer America. "What a thrill for those young players" he thought. "They know that if they work hard enough, one day they may train on that field too." All teams wore the same red and black training uniforms. All did the same training exercises, too. "It became clear to me that at home, with my own teams, I was trying to cover to much," he said. "In a single session I would start out with passing, then do some heading, and then try to get some shooting in. In my week at the club I saw close to 50 training sessions, but did not see many finishing exercises. The only shooting was in the small sided games that would conclude most training sessions." Fisher noted that this was not because the Dutch are not concerned with finishing, but because trainers will not move on to other areas of the game until they are satisfied a team can move the ball quickly and effectively under pressure. After returning to the US, Fisher put the methods he learned into practice with his u12 West Chester United team, in Pennsylvania. The players responded enthusiastically. Fisher was "amazed" at the eagerness with which his players took to the training and how that training transferred to game day. "The team moves the ball quickly," he reported. " Not without error at times, but they work hard at making the right decision." He altered his priorities, too. "Not once have we talked about games we must win, or games we should not lose." he said "Our priority has been to move the ball quickly and to play well. The winning has taken care of itself." Indeed it did: Heading into playoffs, Fishers youngsters have lost only one regular season match.